Fractional CO2 laser works by creating tiny holes or ‘dots’ in the skin’s surface, penetrating deep into the dermis which triggers the body’s natural healing responses. It leaves the skin around each dot intact and has made it possible to achieve results comparable to traditional laser resurfacing with no side effects and profoundly less downtime. It enables the surrounding tissue to heal these microscopic thermal injuries by stimulating the production of new collagen. The CO2 fractional laser is mainly used in aging skin, Melasma, liver spots, age spots freckles, fine lines, wrinkles around lip lines, sun damaged skin, to improve skin tone and complexion, large pores, stretch marks, acne scars, scars from chickenpox, surgical scars, uneven skin, burn scars, etc. This treatment may require single or multiple sessions based on severity of conditions and skin type. 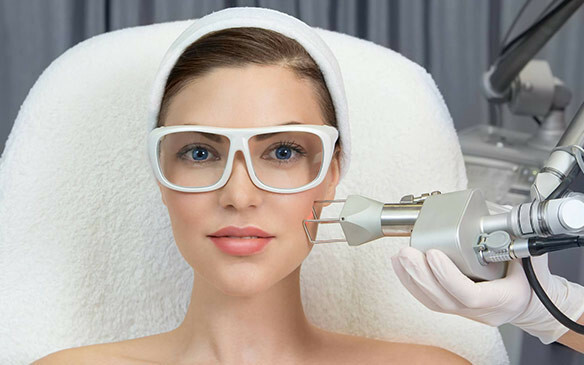 These laser treatments use heat energy. A mild to moderate burning sensation is experienced during treatment and slight swelling, redness and bronzing afterwards. This can be covered with makeup and normally subsides after a 2-3 days, however full healing can take one week, depending on the intensity of treatment and the areas targeted. Results of Fractional Laser therapies vary, depending on the technique and experience of the physicians and the individual patient. Patients should always ask their physician how new the laser machine is. Recent models are far superior to earlier ones in terms of achieving predictable and precise results.